St. Martin's Griffin, 9781250146366, 240pp. 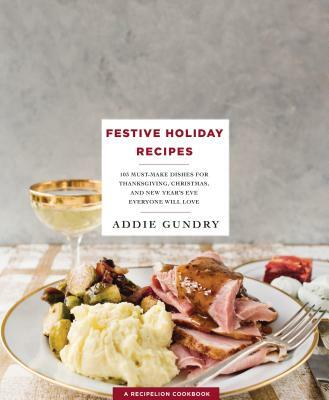 In Festive Holiday Recipes, Food Network star Addie Gundry offers easy, delightful holiday recipes all in one place for everyone looking for that last minute recipe for entertaining. There’s a reason it’s called the most wonderful time of the year. From easy appetizers for holiday and New Year’s Eve entertaining, like Caramelized Onion Tartlets, to recipes for The Best Roast Turkey and all your favorite sides, pies, and even leftover ideas, this book is a home cook’s trusty sous chef for easy and elegant entertaining throughout the holiday season. Three words to remember: Salted Caramel Eggnog. Each recipe is paired with a four-color, full-bleed photo. Recipe Lion is part of Prime Publishing LLC, a lifestyle multi-platform brand focused on cooking and crafting content. The Prime group receives over 68 million monthly page views, and over 7.9 million readers subscribe to Prime’s family of email newsletters. Prime has leveraged their extensive user base, search data, and SEO expertise to choose topics and recipes for the cookbook series.